To play Necrotic Drift in Linux or a Mac, you need an interpreter program. Download Hugor for Linux or Mac, OS X 10.7 and up. 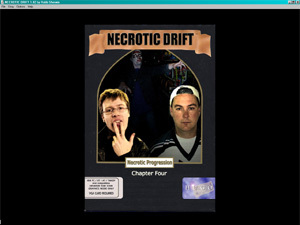 Necrotic Drift is a survival horror text adventure… but with graphics and sound! An homage to the old Magnetic Scrolls game in presentation. Jarret Duffy knows everything about Dungeons & Dragons– a sad fact which has secured his position as assistant manager of Benji’s Gaming and Role-Playing Emporium. When not earning minimum wage, Jarret obsessively rents The Fellowship of the Ring to point out trivia to his loser roommates and maintains and on again/off again relationship with Audrey. 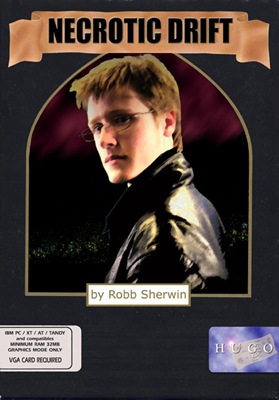 However, when Jarret disrupts a Summoning Session (by the Wiccan girls at the Bead Shop) and the undead start visiting the Funtime Teen Mall, he’s just the man to have around. Jarret now finds himself in the unlikely position of hero, but can he do it? Nominated for 8 XYZZY Awards. Winner: Best Non-Player Character, 2004. Tested by James Bernoski, Jonathan Blask, Greg D’Avis, Joachim Froholt, Paul Kostock, Jacqueline A. Lott, Drew Mochak, Dayna Rich, Gunther Schmidl, Mike Sousa and Adam Thornton. Acting by Alex Gray, Steve Oelheim, Jamie Byrnes, Jill Leckie, Tammy Bancroft, Jonathan Blask, Matt Davis, Michael Sherwin, Joe Mason, Ben Parrish, Bryan Sailer, Jeff Kyle, Gerrit Hamilton, Laura Randall and Dayna Rich. Music by Gerrit Hamilton and Ben Parrish. Article by Emily Short at Play This Thing! Stuck? Need help? Walkthrough by Natalie Charlesworth. 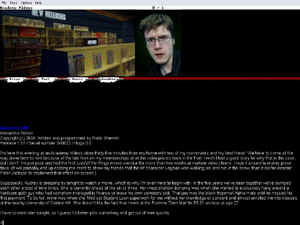 http://www.joltcountry.com/index.php/robbsherwin_videogame/necrotic-driftYou must be logged in to post a comment.